So here we are at Botanical week. another new one for GBBO 2016 and I have to say I loved it. I was very drawn to the Signature this week.. A Citrus Meringue Pie! I smiled at this because for my own time in the tent, I made a lemon/lime meringue pie and it went down a treat..The rest of that week didn't, but I got good feedback on that bake. Focus on the positives right? Not to be one to shy away from a challenge I decide to take on the three tier Flower Showstopper. What was I thinking? You know the way there are 24 hours in a day.. Loads of time sure! Yeah but but the time you factor in everything else that happens in life and actual cake orders that you need to get out, the decision to make a three tier cake, basically became "for the craic"!! I decided on a theme. A citrus theme. It wasn't a massive cake either, I hate waste so there was no way I was making a giant cake with no one to eat it! From bottom the top you have a Lemon and Raspberry, lemon curd and vanilla frosting filled 8 inch. 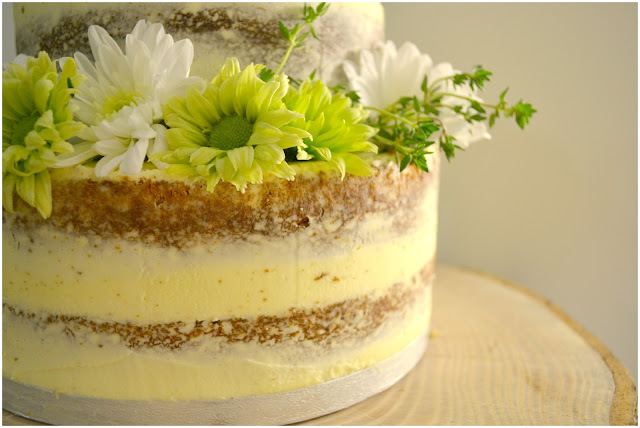 On top of that is a 6 inch orange and almond buttermilk cake with an orange blossom honey buttercream filling. Then the third layer is a teeny tiny 4 inch, coconut sandwich cake, filled with a lime curd and coconut buttercream. (I wasn't happy with the coconut cake so have omitted the recipe until I Goldilock's the crap out if it!). 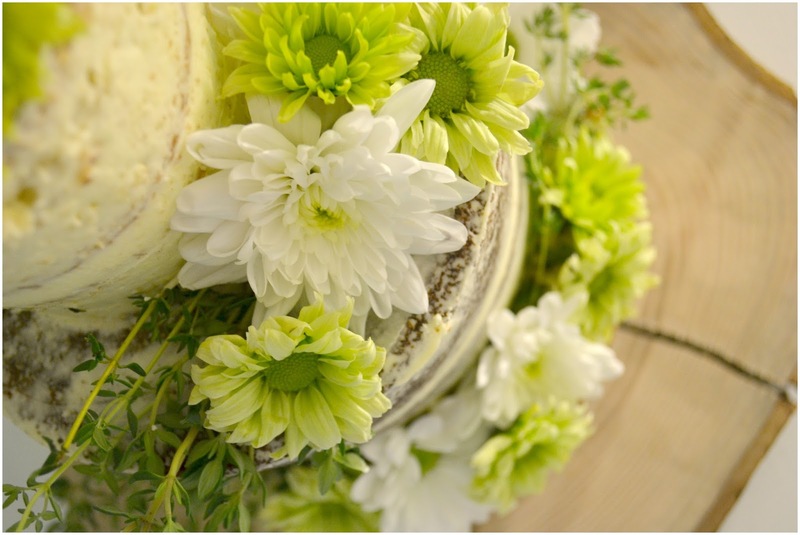 I wrapped the whole thing in a basic high-crusting buttercream, left it semi naked because I am lazy and decorated with daisies and thyme. I am also very glad that Tesco sent me a lovely voucher to help me buy everything needed for this bake. 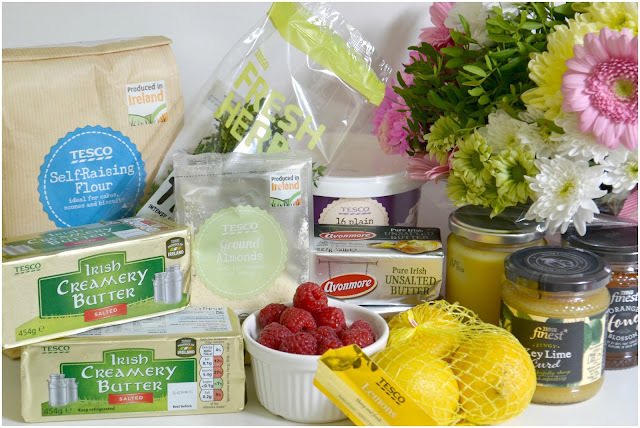 I was also incredibly lucky to be able to spend the voucher on products that Tesco have sourced in Ireland and made a conscious decision to buy the Tesco own brand products, that helped Irish farmers and producers! I have given you the measurements for 8 inch cakes, should you choose to bake them. 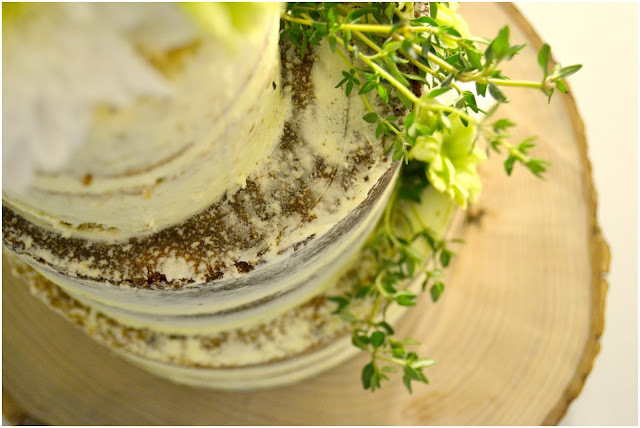 I haven't downsized as I figured, no one really needs three tiers of cake at any one sitting.. save for wedding and birthdays so you won't have to worry about changing anything. Fire away as is. Preheat the oven to 350F or 180C or Gas mark 4. Line and grease two 8 inch pans. Cream your butter, zest and sugar until light and fluffy and pale, I usually leave my mixer on for about 5 minutes. Add in an egg, one at a time until the yolks have been disappeared. Dry whisk or sieve your flour and baking powder together. Add half your dry ingredients to the butter/sugar/egg/vanilla mix and then half the buttermilk. Follow with the lemon juice. Mix until combined and repeat the half and half step. Be careful not to over mix the batter here as you want the cake to stay light and fluffy. The buttermilk helps with that too. Just make sure all the ingredients have been mixed together. Fill your cake pans and bake in a preheated oven. Bake for 25-30 minutes. Adjust your baking time to suit your oven. You'll know when they are done as the top is golden, has a slight spring in it when you gently push down on the top or a skewer inserted in the middle comes out clear! Allow to cool for about 10 minutes, remove from the pans and cool fully before assembly. Preheat your oven to 180C, 350F or Gas mark 4. Grease and line two 8 inch pans. Cream the butter and sugar until light and fluffy and pale. Dry whisk or sieve your flour, ground almonds and baking powder together. Add the vanilla to the egg/sugar/butter combination. Add half your dry ingredients to the butter combo and then half the buttermilk. Mix until combined and repeat. Just make sure all the ingredients have been mixed together. Fold in the zest and juice. Transfer the batter into a prepared tins and bake for 20 to 25 minutes, depending on you oven. You'll know it's done as the top will be golden, have a slight spring in them when you gently push down on the top or a skewer inserted in the middle comes out clear! Add in the icing sugar a few cups at a time. If the buttercream is very thick, add a tablespoon of cream or milk in until the desired texture has been reached. Add the vanilla bean or paste. Mix the holy moly out of it until light and fluffy. The faster and longer you mix this, the lighter and fluffier it will be. Once the cake is cool add the first layer, top side down. The underneath part is flattest. Fill with a layer of buttercream and your filling. I used Tesco Lemon Curd in the Lemon and Raspberry cake an Orange Blossom Honey to flavour my buttercream in the Orange and almond cake. Add the next cake layer, again top side down. Fill in any gaps and smooth out your buttercream. Pop the cake in the fridge/freezer for a few moments, to harden the buttercream and make the cake more stable to work with. Remove the cake from the fridge and add the buttercream to the top and sides and smooth out. I have left this semi-naked because a) I'm a tad lazy and b) that's how I like cakes to look. I reckon I fit the brief.. I will post some photos of the inside as soon as it's cut open and I have the day light back... I hate photographing at night, I really am no good it! For more GBBO inspiration, head to Jenny's Blog and spy the other goodies the bakers whipped up. And just to keep you all in the loop about things going on... The results of my Masters are back.... drum rooooollllll... I will be graduating in three weeks with a First Class Honours. Which is pretty damn special. Blowing my own trumpet here.. TOoT!! My bakewell tart from last week also earned me STARBAKER. So double win... TOoT ToOT!! So pretty Hazel! I love that you made this just for fun. Hope you enjoyed eating it. The flowers look gorgeous and I love the naked effect. That looks so pretty and as as always with your bakes... I want to come over and see you for a slice! 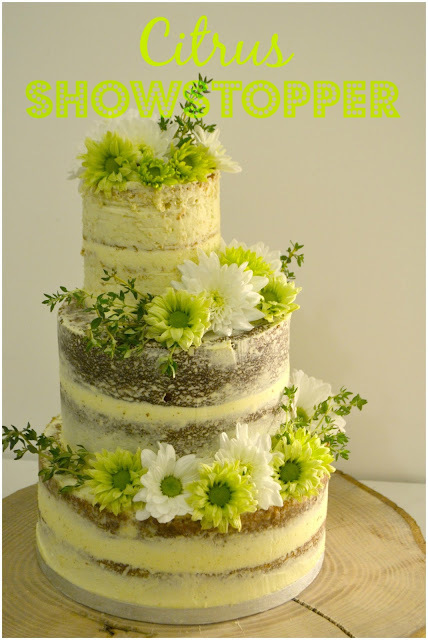 stunning cake - this would make an amazing wedding or birthday cake. 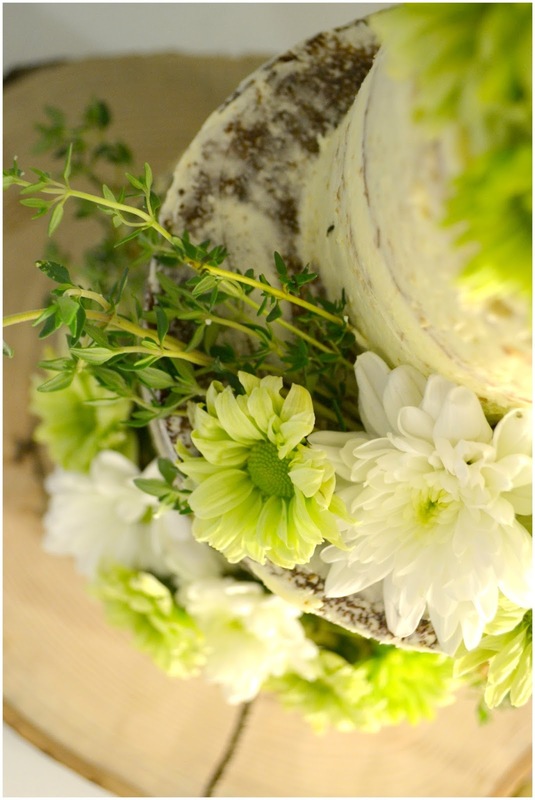 the colours of the flowers and herbs really add that finishing touch. well done on your 1st class honours - amazing! Wow this looks gorgeous! I love the flavours you've used.